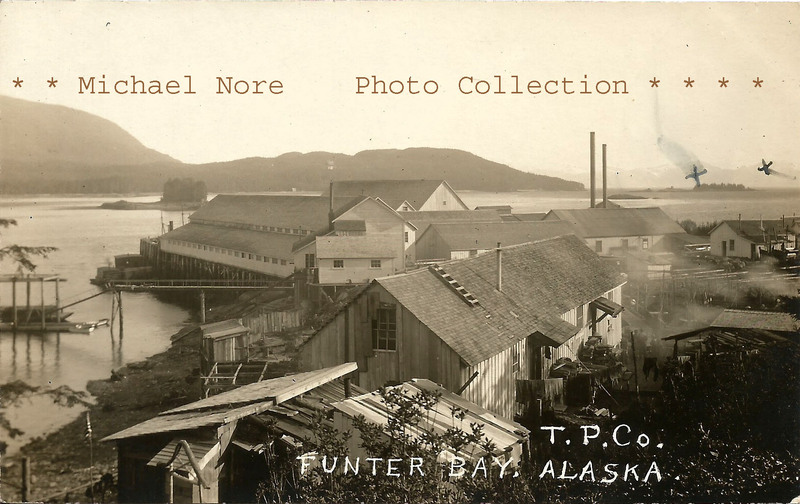 I recently received a few Funter Bay images from Michael and Carolyn Nore, collectors of historic Alaska postcards and photos. These show some of the Thlinket Packing Co’s operations between about 1914 and 1920. Most are prior to 1918 (based on the cards used), but some are from the same summer as the photos seen previously in this post. 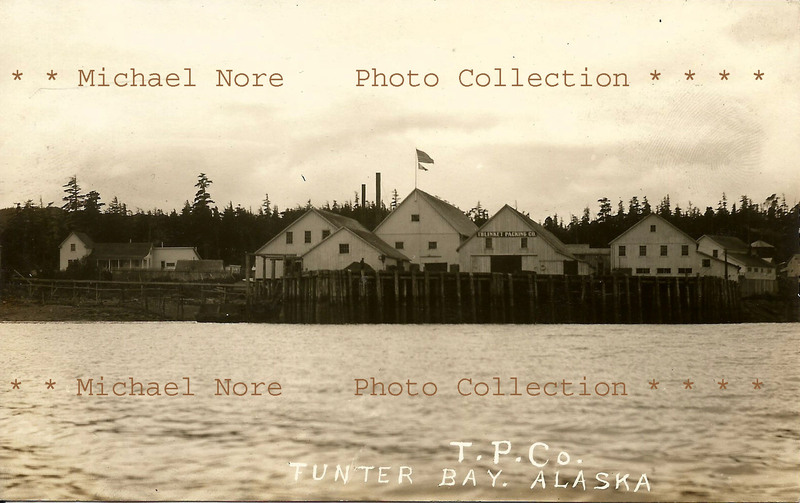 The first photo is a great shot of the Cannery wharf and main buildings, marked “Front View of Cannery”. The large “Thlinket Packing Co” sign is visible above the warehouse. The mess hall and store is barely visible in the rear right, and the Superintendent’s house with its large porch is seen on the left. 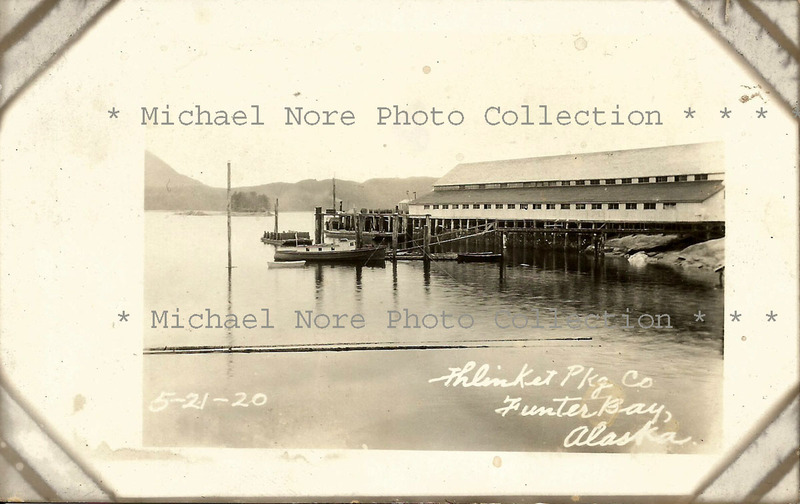 Moving inland, a set of two images show the rear of the cannery buildings. The large chimneys were from the main boiler house. The previous photo shows a number of handprints marking the foreground building. I am not sure what this building is, as it does not appear on either the 1964 or 1942 property maps. 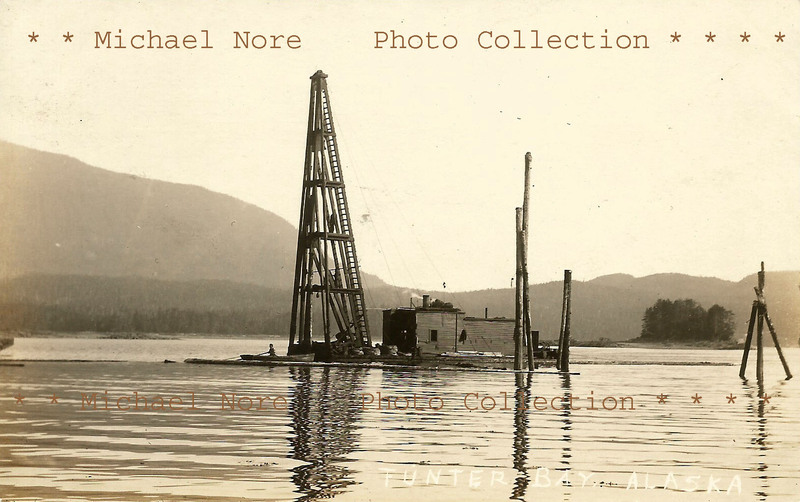 Another set shows one of the cannery’s steam-powered pile drivers. I am not sure how many of these units the Thlinket Packing co owned, the remains of a smaller one is on the beach at Funter Bay. A large unit nearly identical to the one in these pictures appears in a 1926 photo at the mine wharf (seen on this page). 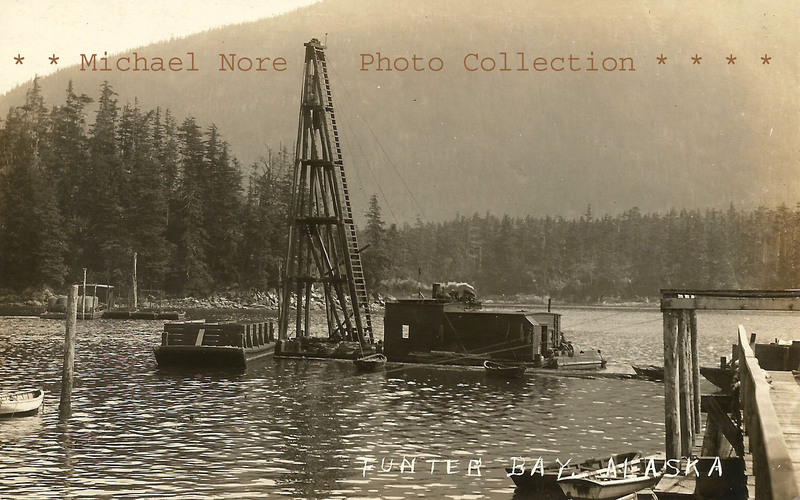 The photo below shows a gas boat or launch under the pipeline from the cannery’s oil tank, in June 1920. The next photo is labeled “One of the company tugs with a diver repairing her rudder”. 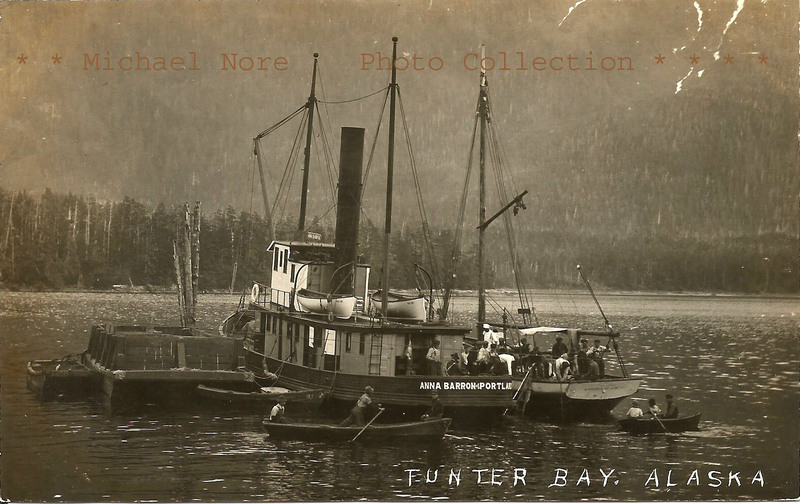 It shows a sailing vessel alongside the cannery’s steam tug Anna Barron and a variety of smaller boats. Men on the sailboat are operating an air compressor and have lowered a ladder and several pipes and ropes over the side. What appears to be a diving suit is draped over the sailboat’s boom. Moving up in vessel sizes, the next photo shows the Pacific Coast Steamship Co’s City of Seattle at the cannery wharf. The appearance of the ship dates this to 1914 or later, as the City of Seattle was completely rebuilt that year and converted from coal to oil fuel. 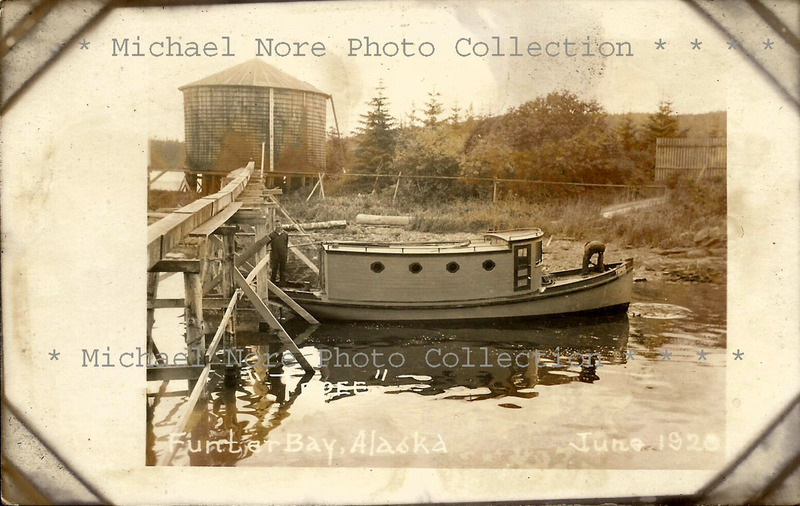 Prior to 1914 the ship had a different superstructure and the foremast was aft of the wheelhouse, as seen here. The re-built ship can also be seen here and a description of the refit is here. 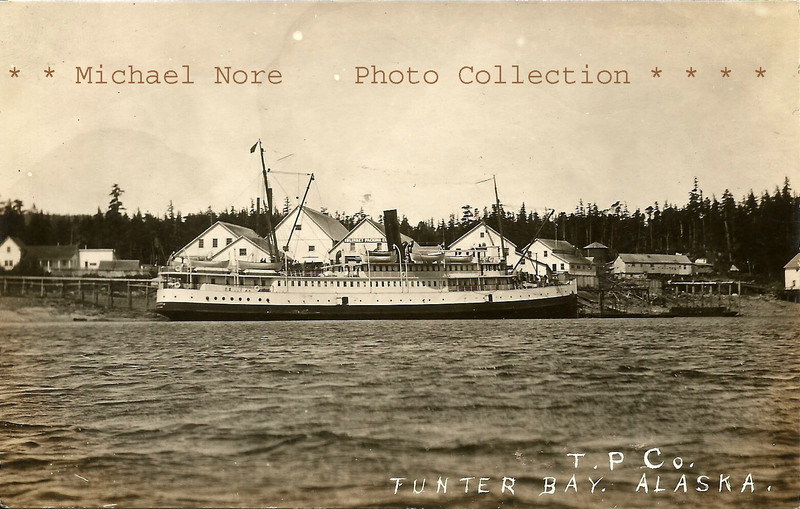 Like other commercial steamers, the ship would call at canneries as needed to transport supplies, products, and workers. 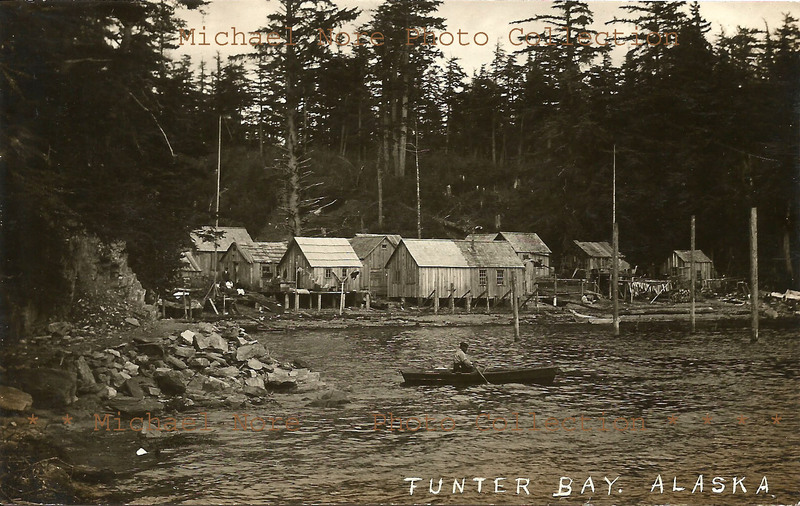 Next is a photo of the “Indian Village” located Northeast of the cannery. While postcards tend to call this a village, most accounts state it was not occupied year round. 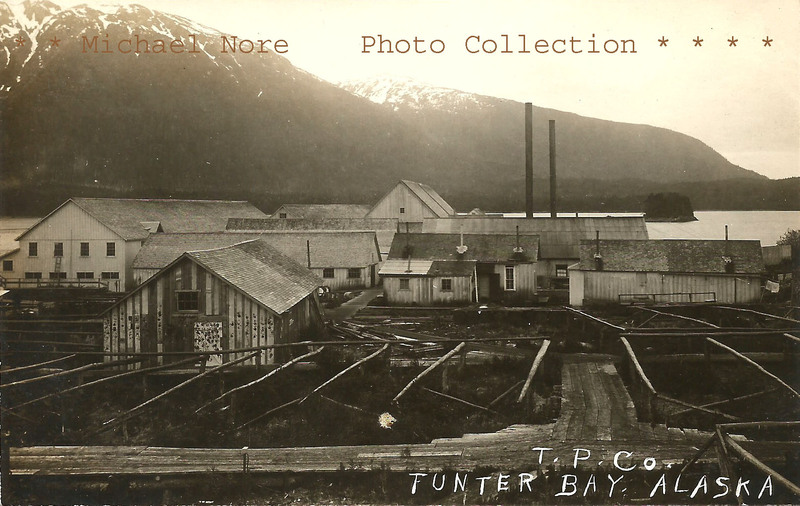 The area was more of a seasonal camp for native employees of the cannery who lived there in the summer. 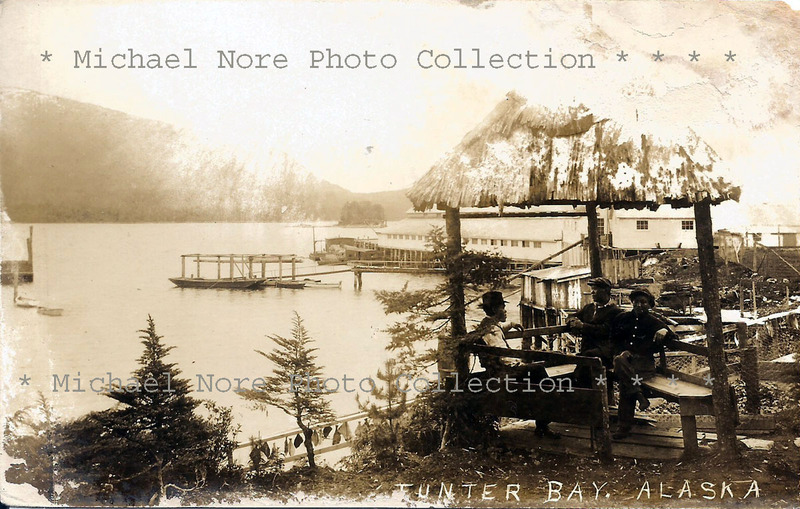 And the last photo shows an interesting gazebo on the hill behind the cannery, with some Tlingit employees relaxing on benches. What appear to be a number of halibut can be seen hanging from the boardwalk below. The date is not given but is probably between 1914-1918. Thanks again to the Nores for sharing these great images!